[EN] Soleil Politique is a book conceived by curator Pierre Bal-Blanc, in dialogue with graphic designers Vier5 and Paraguay Press. It dwells on the radical exhibition that Bal Blanc, the former director of CAC Brétigny and a member of the curatorial team of documenta14, organized at Museion, Bolzano, in 2014, overturning the space of the Museum to present works by many artists. The catalogue Soleil Politique, examines the exhibition’s starting points in the writing of a group of thinkers and artists, its methodology inspired by the musical compositions of Cornelius Cardew and some of the consequences and afterthoughts the exhibition provoked. It also presents a comprehensive photographic and textual documentation of the works presented in the exhibition. [FR] Soleil Politique est un livre conçu par le curateur Pierre Bal-Blanc en collaboration avec les graphistes Vier5 et Paraguay Press. 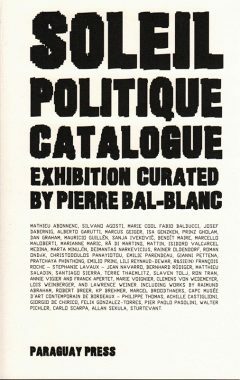 Il revient sur l’exposition radicale que Bal-Blanc, ancien directeur du CAC Brétigny et membre de l’équipe curatoriale de la documenta14, a organisée au Museion de Bolzano en 2014, transformant l’espace du musée pour y présenter les travaux de nombreux artistes. Les textes publiés dans Soleil Politique analysent la genèse de l’exposition, sa méthode – inspirée par les compositions musicales de Cornelius Cardew – ainsi que ses enseignements et quelques unes de ses répercussions. Les oeuvres présentées dans l’exposition y sont exhaustivement documentées et reproduites. Artists / Artistes : Mathieu Abonnenc, Raimund Abraham, Silvano Agosti, Marie Cool Fabio Balducci, Robert Breer, K.P. Brehmer, Marcel Broodthaers, Achille Castiglioni, Giorgio De Chirico, Josef Dabernig, Alberto Garutti, Marcus Geiger, Isa Genzken, Prinz Gholam, Felix Gonzalez-Torres, Dan Graham, Mauricio Guillén, Sanja Ivekovié, Benoît Maire, Marcello Maloberti, Marianne Maric, Rä Di Martino, Mattin, Isidoro Valcarcel Medina, Marta Minujîn, Deimantas Narkevičius, Rainer Oldendorf, Roman Ondàk, Christodoulos Panayiotou, Emilie Parendeau, Pier Paolo Pasolini, Gianni Pettena, Pratchaya Phinthong, Walter Pichler, Emilio Prini, Lili Reynaud-Dewar, R&Sie(n) (François Roche, Stephanie Lavaux, Jean Navarro), Bernhard Rüdiger, Matthieu Saladin, Carlo Scarpa, Allan Sekula, Santiago Sierra, Sturtevant, Terre Thaemlitz, Philippe Thomas, Slaven Tolj, Ron Tran, Annie Vigier & Franck Apertet, Marie Voignier, Clemens Von Wedemeyer, Lois Weinberger, Lawrence Weiner. With contributions by Pierre Bal-Blanc, Thomas Boutoux and Joachim Hamou, Emile Ouroumov, and texts by Donna Haraway, Henri Lefebvre, Giorgio Agamben, Hannah Arendt and others.